Wow! 2017 went by in a flash. As I left Chicago for my last road trip of the year, it was hard to believe it was already the holiday season. Even though Thanksgiving had already come and gone, it seemed far too soon to be thinking about Christmas. The weather was more like autumn than winter, which only increased my disbelief that I needed to start counting down the shopping days. There (thankfully) wasn’t a single snowflake on the ground as I boarded the plane, accompanied by Kimberly Black, Member Services Administrator for NationaLease. We landed in Cleveland after the short flight, got in our rental car and headed toward Latrobe, PA to visit Tom James at Fox & James NationaLease. in this part of Pennsylvania, which explained the unusually large number of employees who had taken the day off work. Fortunately for us, Tom hadn’t joined the hunters, so we sat down with him in his new office. 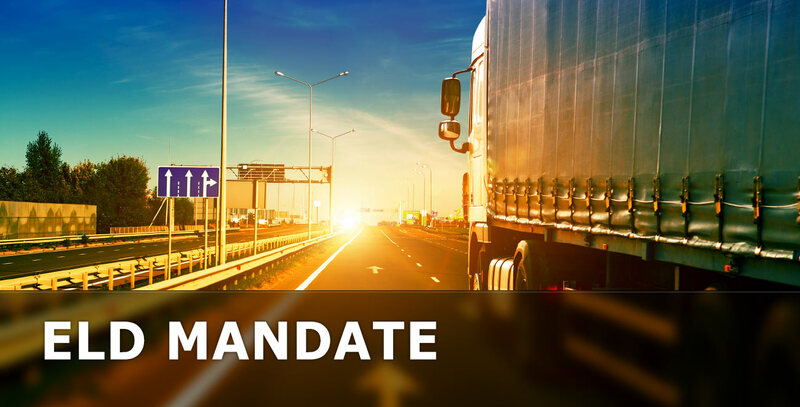 We discussed the upcoming ELD Mandate, the challenges for our customers, and how NationaLease members are gearing up to help them. He pointed out the need for updated PM guidelines, and I let him know that NationaLease is currently working on a template for our members to use. We also shared information with him about several of the new supplier partnerships now available to our members. After a great conversation, we got back into the car toward Cleveland and drove west into the nearly blinding sun. Could it really be December already? Back in Cleveland, we checked into our hotel then ventured out to find a restaurant called Pupuseria La Bendicion. Kimberly had found some reviews saying that they served excellent Salvadoran food, and since neither of us was familiar with Salvadoran cuisine, we had to give it a try. We had a little trouble finding it at first since it is located in a small strip mall in a mostly residential neighborhood. The street was dark and the sign fairly small, so we drove right past it the first time. We had some hesitation as we walked in to see just a counter with a handwritten menu and a couple of tables. Even the menu looked intimidating, as it was all in Spanish with foods we had never heard of. We chose a few interesting sounding dishes and sat down apprehensively to wait. Once the food arrived however, all our unease vanished. Silvia served us a platter heaped with scrambled eggs, refried beans, fried sweet plantains, chicken tamales, pillowy handmade corn tortillas, and the namesake pupusas. 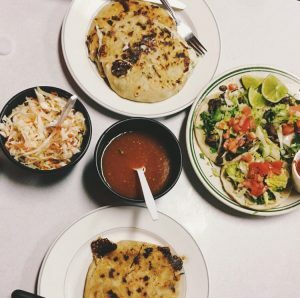 A pupusa, as we were about to discover, is a traditional Salvadoran dish of a thick corn tortilla stuffed with a savory filling, in this case flavorful chicken. Even though we had ordered only one main dish to share, it was more food than we could eat and we went back to the hotel full and happy. 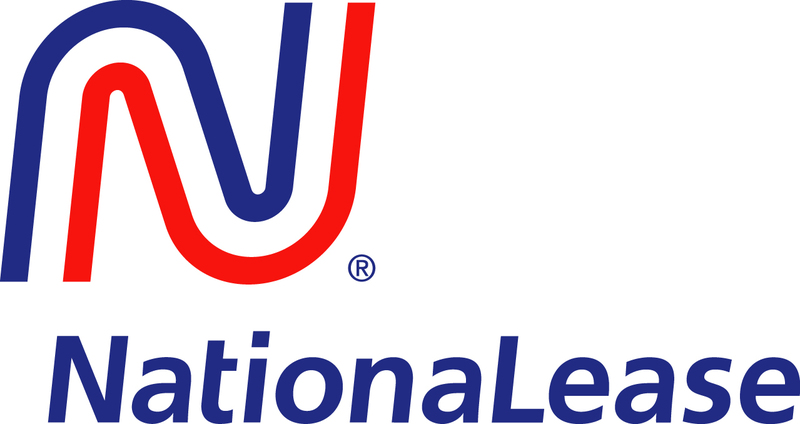 The next morning, we had a short drive to meet with NationaLease’s newest member, Fleet One Leasing NationaLease. We had the whole team gathered around the table as we answered questions and shared information about NationaLease’s programs and services and the stringent requirements for being part of the NationaLease system. We discussed our National Account Rental Program that offers our customers the ability to rent trucks and purchase rental insurance anywhere throughout North America. We let them know about the variety of educational and training opportunities available to NationaLease members. We explained our partnership with Universal Technical Institute, as well as other recruiting resources available to them. And of course, we described our Reciprocal Service network and the tremendous benefits their customers will have now that they have access to over 700 service locations. Fleet One adds to that service network with locations in Valley View, Medina, Parma, and Toledo, Ohio, and Monroe, Michigan. We are excited to welcome Brian O’Donnell and his entire staff into the NationaLease system! From Cleveland, we got back on the road heading east to Erie, PA. Once we arrived, we met with Joe Benacci of Benco Leasing, LLC, a NationaLease Member. 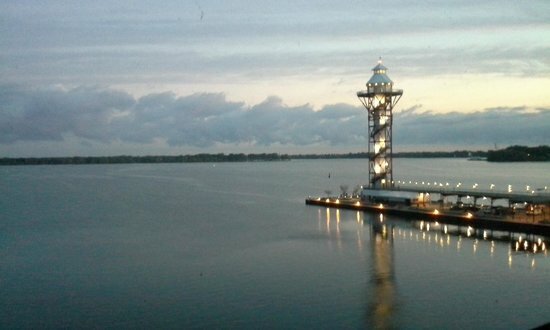 Joe is a wonderful ambassador for Erie. He took us on a drive to visit his other location in Erie, and gave us a full guided tour of the town along the way. Once a major port city, railroad hub, and steel and iron center, Erie was hit hard in the 70s with the downturn in manufacturing. It is now recovering from its Rust Belt reputation as an emerging center for biofuels and environmental research, and a hub for healthcare, with several major hospitals in town. The downtown area is undergoing a revival, as well, with new shops and restaurants opening in former industrial spaces. Joe drove us down to the Bayfront area, which has a new convention center, hotels, and a lovely park. We stopped for a cocktail at the Sheraton overlooking the bay. The hotel lobby was draped in garland, greenery, and twinkling lights with Christmas music softly playing in the background. It was a perfect setting to chat while we watched the sun set over the bay. Joe invited us to join him for dinner at the Erie Club, housed in a perfectly preserved Greek Revival mansion located in a part of town known as Millionaire’s Row. After a delightful dinner and many entertaining stories, Kimberly and I reluctantly headed back to Cleveland to get some sleep before our early morning flight. It seems that most people have a deep dislike for O’Hare airport. I get it. It’s big and sprawling and always busy, and has a reputation for lots of delays. I may be one of the few people who really likes O’Hare. Maybe it’s because I spend a lot of time there and have learned all the shortcuts and secrets, but I actually find it to be a very happy place. People are excited to be leaving on vacation or glad to be returning to friends and loved ones. There’s always a sense of anticipation and adventure. 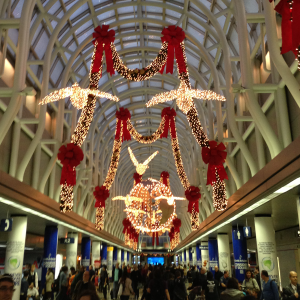 I arrived at O’Hare, groggy from the early hour and my nap on the plane, to find it spectacularly decorated for the holidays. The atrium in Terminal 3 is breathtaking if you stop to look up. Enormous doves fly through cascades of green garlands and red velvet ribbons. As I walked into that atrium with the bustling travelers and sparkling lights it finally hit me. It’s Christmas time: time to take a moment from the daily grind to stop, look, and appreciate the joy all around us. From dear friends, to new adventures, to simple pleasures like a good meal or a stunning sunset, there are plenty of moments we can appreciate. I hope that your holidays provided you that moment of joy. If not, it isn’t too late. Whatever you’re doing, just stop and look. They are really always there.